Discuss all Certainty3D TopoDOT related issues here. 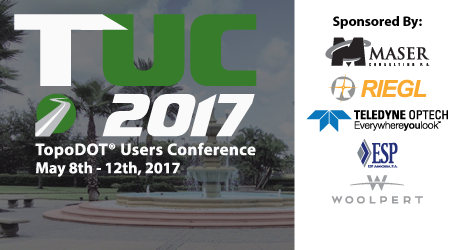 Please join us at TopoDOT® Users Conference (TUC) being held at the beautiful UCF Rosen College campus in Orlando, Florida. This global gathering of the TopoDOT® Users community will feature an extensive learning program for every level of TopoDOT® experience. Technical Attendees will gain a deeper understanding of point cloud data and greatly improve TopoDOT® skills for extracting topographies, models and spatial information meeting the requirements of downstream design, engineering and construction operations. In addition, a separate Management track will focus on the requirements of management and business development professionals. These courses will provide a broader overview of the technology, requirements, application and administration issues required for the successful integration of LiDAR technology and data across operations. But that’s not all! Conference sponsors will be on hand to share the latest in hardware technology and their expertise in its real-world applications. Simply schedule a demonstration and/or meeting with these industry leaders at your convenience throughout the week. TUC will provide the training and information you need to maximize the value of your investment in this exciting and rapidly growing technology.